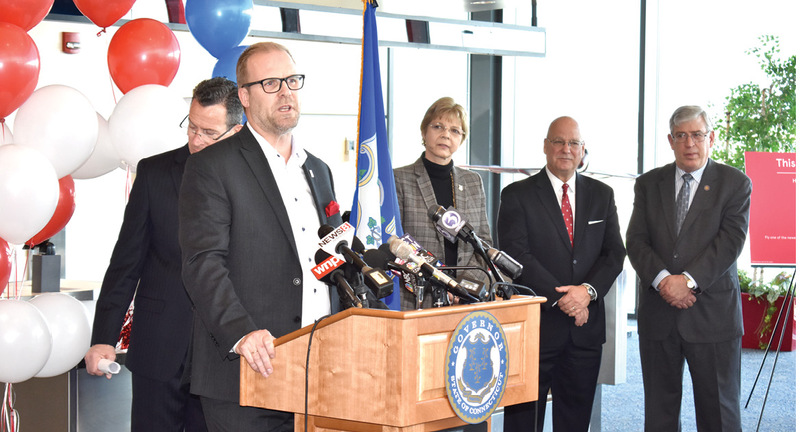 At Bradley International Airport on February 23, Lars Sande, senior vice president for sales of Norwegian Air International, responds to the welcome his company had received from Governor Dannel Malloy, partially hidden behind Sande. At the right are Suffield’s Representative Tami Zawistowski, Executive Director Kevin Dillon of the Connecticut Airport Authority, and Representative Scott Storms of Windsor Locks. Amazingly, Norwegian Air’s promotional fare one-way across the Atlantic (to Edinburgh, Scotland) is only $65.